Apparently Champagne will be most prominent region which dramatically improve its quality for the next ten years. 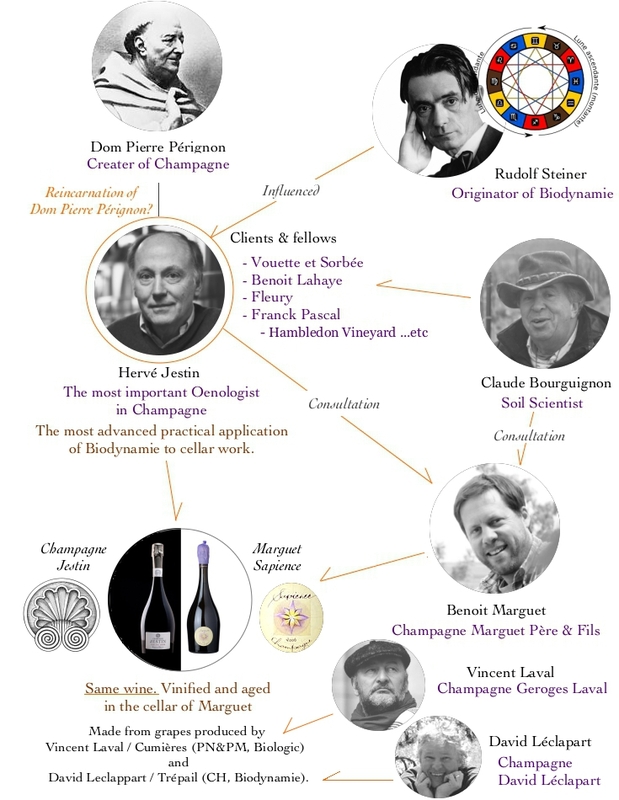 Revolution has already started since mid 00's and many Champagnes which are under the influence of Hervé Jestin fascinate serious wine connoisseurs today. All of Hervé Jestin's theory and practice are based on Biodynamie. Generally "Biodynamie" is considered as the matter in the vineyards and it is separated from wine-making in the cellar. In fact, most of Biodynamique producers(or Vin Nature producers) are trying to minimize the operation in the cellar. They are thinking that less intervention is better. However Hervé Jestin says his Biodynamique approach keeps on running in the cellar. He widely and deeply applies concept of Biodynamie to operation in the cellar. As a result, he has successfully maintained(rather enhanced) "energy and vibration" of biodynamic grapes to the wine, and transferred them into the bottle without any loss. Please remember the sense of Feng-Shui. Biodynamie and Feng-Shui has lots of similarities and it is telling same thing by different language. Practically Hervé Jestin's method includes these approaches. It is easy to understand for Hong Kong people. Vincent Laval has began to release "Garennes" since 2015 vintage. This parcel is situated in Chambrecy in the Vallée de l'Ardre and mostly Pinot-Meunier are planted. Garennes is 100% Pinot-Meunier Champagne, composed by grapes from Chambrecy and the rest is reserve wines from Cumières 2013, 2014 and 2015. Usually Vincent's wines are made as "brut nature", but he made it with 1g/L dosage for this cuvée. This cuvée "Cumières Premier Cru Brut Nature - L0212 - Millésime 2012" has been released as "vintage Champagne"(L0112 had also been released as NV cuvée. SO there are two Cumières Premier Cru from 2012). Chardonnay, Pinot-Noir and Pinot-Meunier. Non-filtered, non-fining and non-dosage. Dégorgement : 9th September 2016. This cuvée "Cumières Premier Cru Brut Nature Rosé - L0304" is composed by 50% Pinot-Noir and 50% Pinot-Meunier from 2014 vintages. Non-filtered, non-fining and non-dosage. Dégorgement : 1st February 2017. Only 2,495 bottles made. Vincent Laval has managed 2.5ha of vineyards of Cumières since 1996. His father Georges Laval was one of the oldest producer who obtained biologique certificate(in 1971) in Chanmpagne. The wine has superb purity of fruits and mineral, and sensational verticality. This cuvée "Cumières Premier Cru Brut Nature - L0114" is composed by Chardonnay 1/3, Pinot-Noir 1/3 and Pinot-Meunier 1/3 all from 2014 vintage(without reserve wine). Non-filtered, non-fining and non-dosage. Dégorgement : 6th December 2016. Production : 6,345 bottles. Herve Jestin partnered with Benoit Marguet to create this wine, the first ever certified organic prestige Champagne blended from across the region. They released same wine with two different labels. One is Champagne Jestin, the other one is Sapience/Marguet. Grapes are from the fellows of Hervé Jestin, Vincent Laval(Cumières, PN&PM, Biologic) and David Leclappart(Trépail, CH, Biodynamie). The wines were vinified in the cellar of Marguet. for the past ten years and for the coming ten years.